Newspapers, radio and TV crews came to film me working on this location! Playing with a large scale industrial crane! There's very much happening on this 200 meter long track!! A special thanks goes out to the new owners of the factory! 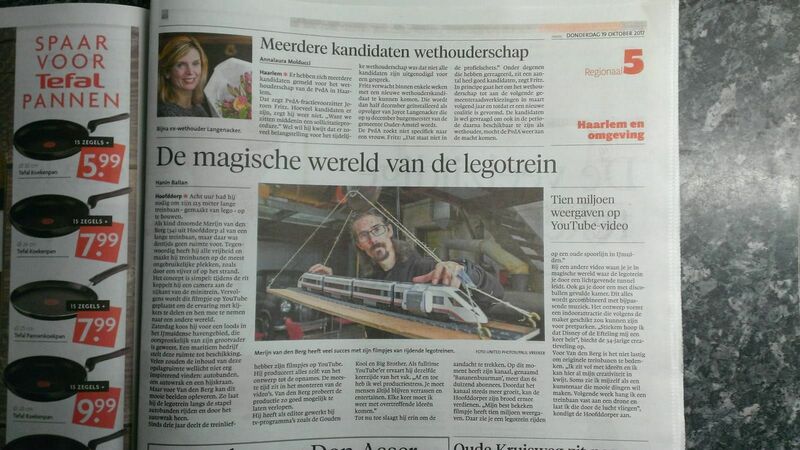 "The Magical World of Lego Trains"
Text under photo: "Merijn van den Berg is very successful with his videos of Lego trains." 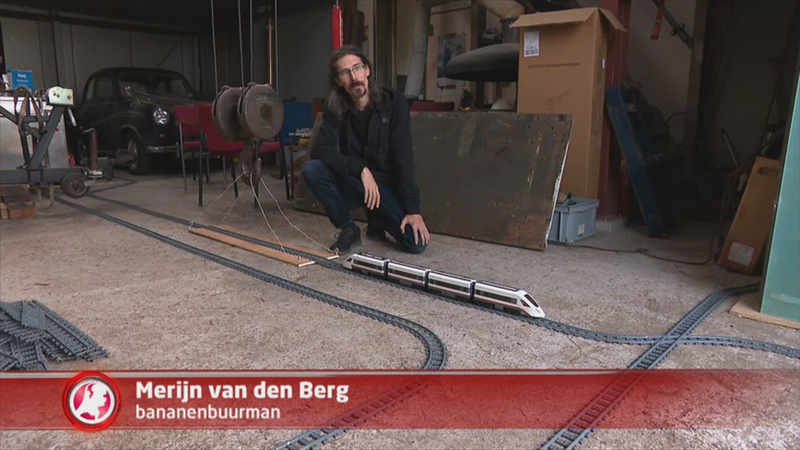 Eight hours he needed to build his 125 meter long trainlayout - made of lego -. As a child, Merijn van den Berg (34) from Hoofddorp already dreamed of a long train layout, but there was no room at that time. Nowadays, he has all freedom and makes railways in the most unusual places, such as by a pond or on the beach. The concept is simple: during the ride, he connects a camera to the mini-train. Next, this video will be posted on YouTube to share the experience with the audience and take them to another world. On Saturday he chose a warehouse in the IJmuiden harbor area, originally owned by his grandfather. A maritime company makes this space available. Many might not find the contents of this storage space to be very inspiring; car tires, a car wreck and a crane. But for Van den Berg this can produce beautiful pictures. He drives the lego train along the stack of tires and drives through the car wreck. For three years, the train lover has shared his videos on YouTube. He produces everything himself: from design to recordings. Most of the time goes into editing the videos. Van den Berg tries to make the production run as smooth as possible. He worked as an editor for television shows such as the Golden Cage and Big Brother. Being a full-time YouTuber, he also experiences the other side of the success: "Occasionally, I have production stress. You must be on top of everything and keep people entertained. Every time I have to come up with superfluous ideas. "So far, he succeeds in drawing attention. Currently, his channel, called Bananenbuurman, has more than 61 thousand subscribers. As the channel grows, the YouTuber can earn its bread.,, My best viewed video has ten million views. There you will see a lego train on an old railway line in IJmuiden. " With another video you will be in magical world where the lego train leads you through a luminous tunnel. You also go through a discoball-filled room. All this is combined with matching music. The design is an indoor attraction that the maker believes would be suitable for amusement parks. "Secretly, I hope Disney or Efteling calls me one day," confessed the 34-year-old creator. For him it is not hard to imagine original train layouts. "I'm full of ideas and I can put all my creativity in here. Sometimes I see myself as an artist who just wants to make beautiful things. Next week, I hang a train from a drone and let it fly through the air." I make videos with Lego trains. I let the Lego train run on all kinds of crazy places. That can be, for example, in a factory, on the beach or in a forest. This is a very sensational environment because of all the thing you can drive through. You can experience how it's like to be a little lego man and see what all those big objects around you look like. I think it stimulates our fantasy. Most of us played with Lego when we were younger and it remains something magical. It's very nice that I can put in all my passion and creativity. My videos are being watched In 172 countries around the world. The Lego train takes a ride upstairs in my Grandpa's old factory! Recently I got a lot of media attention while shooting my latest video.